Delphos Jefferson’s Devyn Carder drives to the basket during Thursday night’s game against Van Wert in Delphos. See more game photos at LimaScores.com. Van Wert’s Jamison Clouse battles Delphos Jefferson’s Macy Wallace for position during Thursday night’s game in Delphos. DELPHOS — The crowd held its breath when Delphos Jefferson’s Sarah Miller’s head smacked the floor after being fouled on a breakaway layup. But after getting a cut above her eye repaired, she was able to return to action. Miller scored 14 points and emotionally led her Jefferson team to a 61-50 girls basketball victory Thursday night against Van Wert at Jefferson. Miller went down with a loud thud with 7:18 left in the third quarter. She was taken to the locker room for observation and was bandaged up. Miller returned to the floor at the 4:39 mark of the third quarter. Miller, who was first team all-Northwest Conference last year, scored six points in the final quarter to help hold off Van Wert. But it was a team win for Jefferson, with four players in double figures. Macy Wallace had 11 points and 11 rebounds for Jefferson. Devyn Carder had 11 points. Alli McClurg added 10 points and 12 rebounds. Addy Stewart had nine points and eight rebounds. Cassidy Meyers paced Van Wert with 13 points and 10 rebounds. Alexis Metz and Jerica Huebner both had eight points. Jefferson is 2-1. Van Wert is 0-3. Jefferson played a 2-3 zone almost the entire way and held Van Wert’s 3-point shooters to 6 of 28 shooting behind the line. “I thought we got out and contested the shots,” Hoffman said. Jefferson also won the rebounding battle 57-47. “I was pleased with our rebounding in the second half,” Hoffman said. The Wildcats took the lead to stay 19-18 on a McClurg fast-break layup late in the second quarter. Stewart followed with a 3-pointer and the Wildcats led 22-18. Jefferson led 26-22 at the half. With Miller returning to the lineup late in the third quarter, Jefferson took a 40-32 lead into the final quarter. Wallace went to the line in the fourth quarter and made 5 of 6 on free throws. 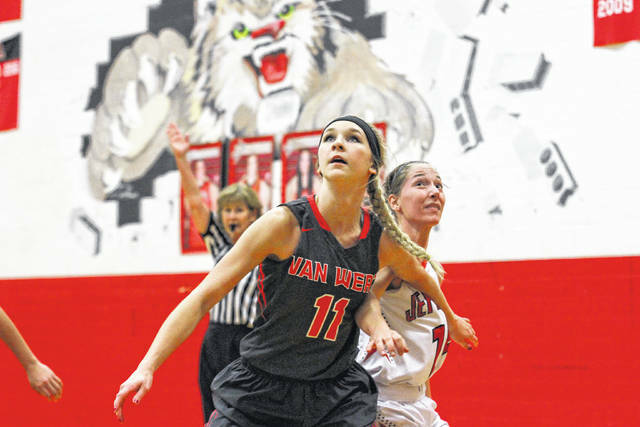 Van Wert shot 27 percent from the field. Jefferson shot 31 percent and was 2 of 11 on 3-pointers. 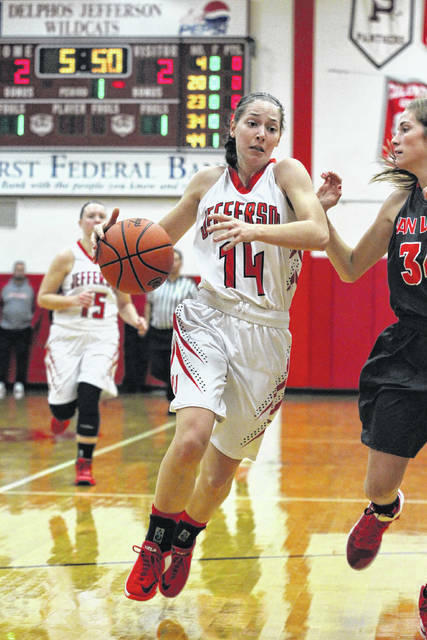 Jefferson had 17 turnovers, while Van Wert had 21. “It was a good game for us,” Hoffman said. This entry was tagged delphosjefferson, vanwert. Bookmark the permalink.